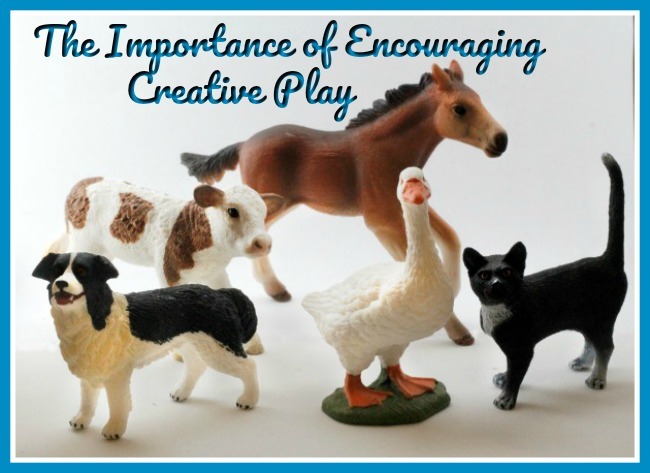 As a first time mom, I didn’t realize just how important creative play really was and how it can help your child in so many different aspects of life. Creative play helps them to grow socially, emotionally and verbally. So many things are technology-based that kids don’t learn how to interact with each other. This is where toys that allow children to pretend play come in to, well, play. I think most parents, like myself, start out by teaching our kids words like cow, horse, cat, and dog. Then we go into the sounds the cow makes – moooo or the dog makes – arf. How many times did you do that? I’m guessing probably too many to count. But why do we do it? Because these are ways we help our children learn new words. This is how we build their vocabulary and their understanding of the world around them. This is huge and I didn’t really realize how huge at the time. Looking back now, I didn’t realize my son wasn’t able to pretend play, he didn’t know how. I didn’t see it at the time but looking back now, I do. He didn’t know how to put himself in someone else’s shoes so to speak. Pretend play feeds that need to express themselves, it allows them to be a cow or puppy or whatever it is they are playing with and show you how they view life as that particular figure. When we allow our children to express themselves, we give them the freedom to grow, to share who they are and what they are thinking. Their play may be the way they tell you about how they are feeling or perhaps a situation that they are trying to tell you about but may not know how. Maybe they are sad and so they make their figure sad, this opens the way for them to express their feelings. Creative play gives children the opportunity to create stories and make them come to life through toys such as the Schleich ones I received for this review. Interaction with others through creative play builds social skills. Children learn how to talk to others, what to do in real life situations by playing those same situations out with toys. They learn skills like turn taking and conversation skills. All skills that they will need throughout their life. I received both the Wild Life Starter Set and the Farm Animal set from Schleich. I just have to tell you about the little calf, oh my goodness, I think he’s my favorite. You look at him and you can almost feel how soft he is. But they are not soft nor fuzzy just so much detail makes them look that way. 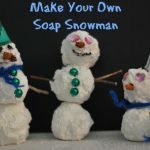 These are well made and they would have stood the test of time with my kids for sure. I’ve passed them along to my nephew who I’m sure will be so excited to get them. The detail on all of the figures is just amazing and so lifelike. That’s what I liked best about the Schleich figures. They are as close to real life looking as you can get as far as I am concerned. I’ve never seen any others with such detail. 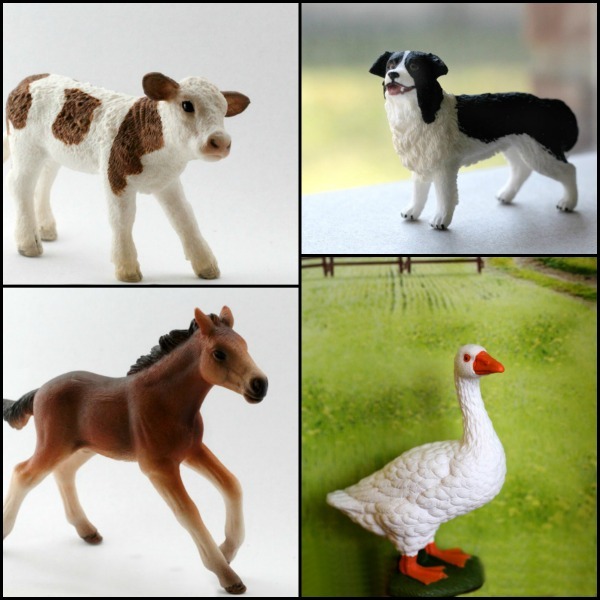 The Farm Animal set includes the Simmental calf, a Mustang foal, a goose, a black and white cat and a Border Collie. 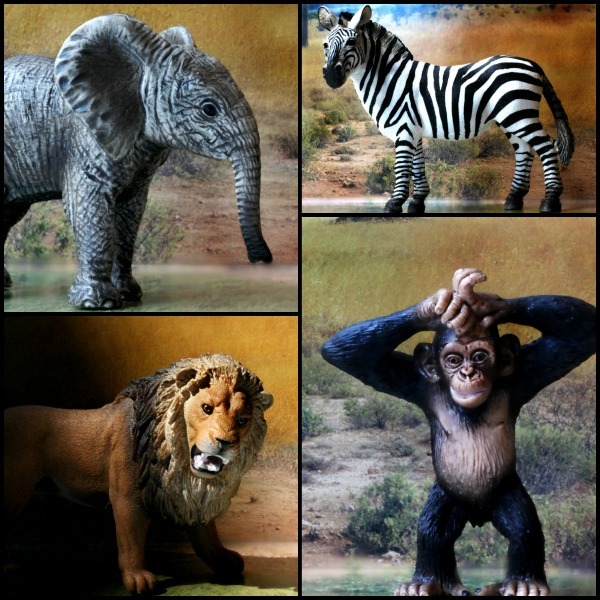 The Wild Life Starter set includes an elephant, zebra, chimpanzee and a lion. I just have to point this one thing out I noticed on the Schleich website, for each product under the description, they provide scientific facts and a fun fact about each animal. It’s more than just a size description, it’s educational. 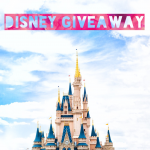 This homeschool mom loves that! Schleich doesn’t just make animal collections, there are dinosaurs, DC Comics, MARVEL, The Smurfs and Peanuts collections. 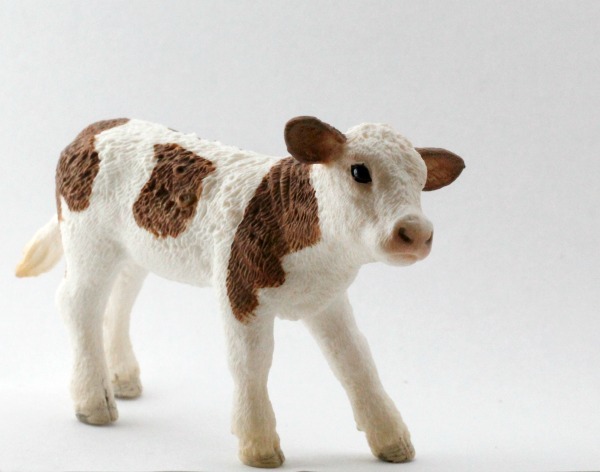 Schleich toys are recommended for ages 3 and up.